For shooters who need a competition 1911, the Range Officer® from Springfield Armory® offers finely tuned performance without breaking the bank. 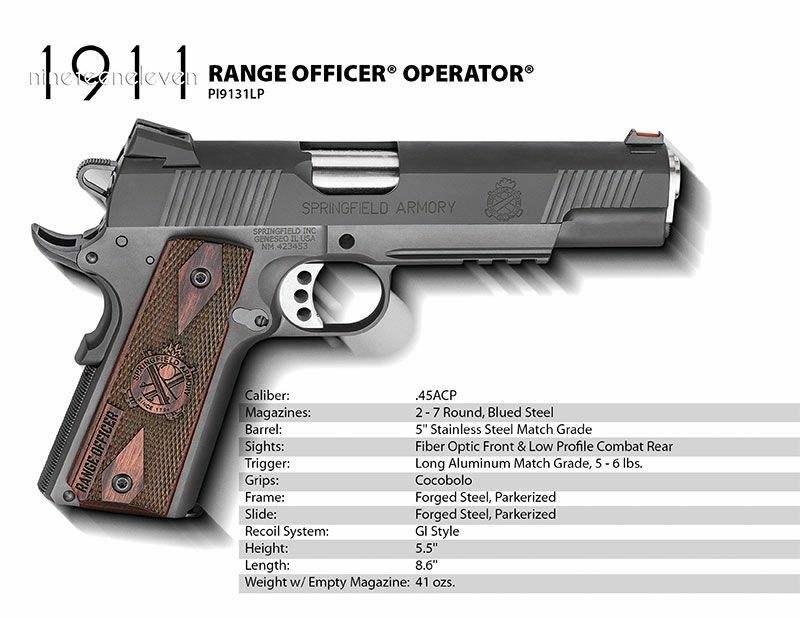 The Range Officer® brings the precision of a competition pistol in a simple and straightforward configuration. The .45ACP Range Officer® has the same quality forged national match frame and slide as the Trophy Match™ and TRP™ 1911s. It gets the same precision fit as these pistols, too. Add in the same match grade stainless steel barrel and bushing, and you have a pistol that shoots well beyond its price tag. The .45ACP Range Officer® is topped with a fully-adjustable rear target sight, so you have maximum flexibility. The beavertail grip safety, extended lightweight trigger and flat mainspring housing allow the pistol to sit in your hand comfortably for long periods of time at the range. The single-sided thumb safety keeps things simple and functional. It all adds up to a pistol that will let you seriously compete in a variety of matches.